Nanga Parbat is the ninth highest mountain in the world with an elevation of 26,658 feet. It is located at the western end of the Himalayan Range in the Gilgit-Baltistan region of northern Pakistan. It is the highest peak in the Nanga Parbat Range. This mountain has three major faces which are Rupal, Rakhiot and Diamir. Rupal Face is the world’s highest mountain face as it rises 4,600 meters from its base to the mountain’s summit. Nanga Parbat is the fourteenth most prominent peak in the world. The first successful ascent of this mountain was made by Hermann Buhl on July 3, 1953. It was a solo climb. This is sometimes known as ‘Killer Mountain’ because 31 people died attempting to climb it before the first successful ascent. Lilliane Barrard was the first woman to climb the mountain. She made her ascent in 1984. The Rakhiot face is covered mostly by the north and south silver cliffs and silver plateau. The steep incline of the peak makes this mountain a very difficult and dangerous climb. The entire Nanga Parbat Range covers an area of 190 kilometers in length and 19 to 39 kilometers in width. This mountain lies just south of the Indus River, in the Astore District of the Northern Areas in Kashmir. Declan, Tobin. " 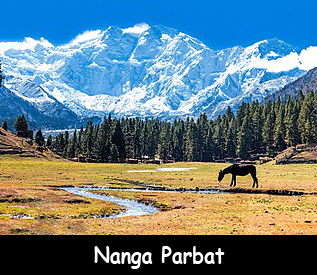 Amazing Facts for Kids about Nanga Parbat ." Easy Science for Kids, Apr 2019. Web. 24 Apr 2019. < https://easyscienceforkids.com/nanga-parbat/ >.